Restaurant manager jobs require you to multitask in order for the food to go from the suppliers to the kitchen to the plate and ultimately to your guests, day after day and night after night. Does your restaurant and hospitality resume serve up a full menu of your skills and accomplishments in food service? 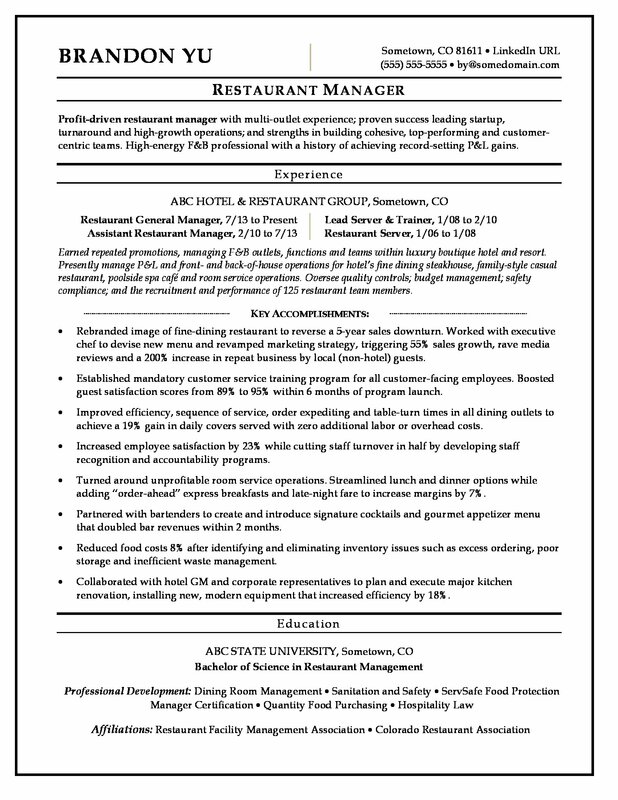 View the sample resume for a restaurant manager below, and download the restaurant manager resume template in Word. Jobs for restaurant managers are projected to grow by 9% (or 27,600 jobs) from 2016 through 2026, according to the Bureau of Labor Statistics (BLS). You'll find the highest level of employment for this job in the following states: California, Florida, Texas, Tennessee, and Georgia; and in the following metropolitan areas: Los Angeles, New York City, Atlanta, Phoenix, and Anaheim. As a restaurant manager, you can expect to earn a median wage of $52,030 per year, or $25.02 per hour, according to the BLS. Additionally, you can learn more about food service careers on Monster. Profit-driven restaurant manager with multi-outlet experience; proven success leading startup, turnaround and high-growth operations; and strengths in building cohesive, top-performing and customer-centric teams. High-energy F&B professional with a history of achieving record-setting P&L gains. Earned repeated promotions, managing F&B outlets, functions and teams within luxury boutique hotel and resort. Presently manage P&L and front- and back-of-house operations for hotel’s fine dining steakhouse, family-style casual restaurant, poolside spa café and room service operations. Oversee quality controls; budget management; safety compliance; and the recruitment and performance of 125 restaurant team members. Rebranded image of fine-dining restaurant to reverse a 5-year sales downturn. Worked with executive chef to devise new menu and revamped marketing strategy, triggering 55% sales growth, rave media reviews and a 200% increase in repeat business by local (non-hotel) guests. Established mandatory customer service training program for all customer-facing employees. Boosted guest satisfaction scores from 89% to 95% within 6 months of program launch. Improved efficiency, sequence of service, order expediting and table-turn times in all dining outlets to achieve a 19% gain in daily covers served with zero additional labor or overhead costs. Increased employee satisfaction by 23% while cutting staff turnover in half by developing staff recognition and accountability programs. Turned around unprofitable room service operations. Streamlined lunch and dinner options while adding “order-ahead” express breakfasts and late-night fare to increase margins by 7%. Partnered with bartenders to create and introduce signature cocktails and gourmet appetizer menu that doubled bar revenues within 2 months. Reduced food costs 8% after identifying and eliminating inventory issues such as excess ordering, poor storage and inefficient waste management. Collaborated with hotel GM and corporate representatives to plan and execute major kitchen renovation, installing new, modern equipment that increased efficiency by 18%. Even after you plug all your skills and experience into this template, you still need to be sure that what you're serving is what hiring managers are ordering. Need some help putting the finishing touches on your resume? Get a free resume evaluation today from the experts at Monster's Resume Writing Service. You'll get detailed feedback in two business days, including a review of your resume's appearance and content, and a prediction of a recruiter's first impression. It's a quick and easy way to give your job search a boost. RESTAURANT MANAGER- BRAND NEW UPSCALE RESTAURANT! GENERAL MANAGER, CHEF, SOUS CHEF, FRONT MANAGERS!